Today the International Amateur Radio Union (IARU) Region 3 conference elected a new chair for 2018-2021. 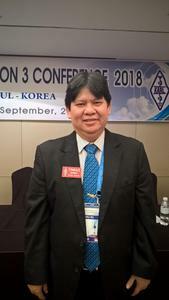 The WIA congratulates Wisnu Widjaja YBØAZ as the new chair of IARU Region 3. Wisnu is from Indonesia and the Indonesian Amateur Radio Organisation (Organisasi Amatir Radio Indonesia ORARI). The IARU returning officers for the IARU R3 2018-2021 directors election, held on September 13, 2018 were Dave Sumner K1ZZ (IARU Global Secretary) and Ole Garpestad LA2RR (IARU Global Vice-President). As the Conference Credentials team, they also oversee member voting, member credentials and proxy validation. The WIA looks forward to working with Wisnu and the IARU in the coming years.